By Beth ParkerA mouthwatering menu. A view of the U.S. Capitol. Sounds like it's stacking up to be one of the D.C.'s finest restaurants. 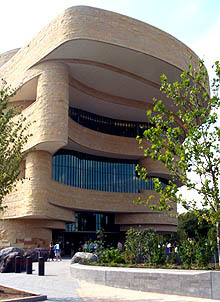 So it might surprise you to know that this place is inside the Smithsonian National Museum of the American Indian. It's called Mitsitam. Executive Chef Richard Hetzler is back to work after a big win Sunday night. A panel of food writers honored Mitsitam with a RAMMY. It's an award handed out by the Restaurant Association of Metropolitan Washington. Mitsitam became the first museum restaurant ever to win a RAMMY. "We all looked at each other. Did they just say the Mitsitam cafe? And then we all stood up and it was on from there," laughs Hetzler. The category is best casual restaurant. It's a boost for the staff at this restaurant where the menu changes every season.Comment: For more on the subject, see Tribal Grounds at Mitsitam Coffee Bar and Chef Showdown at NMAI.